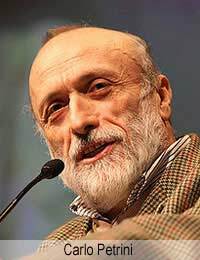 Almost a quarter of a century after first crossing swords with Ronald McDonald, the name of Carlo Petrini has once again left the clown prince of fast food with a nasty taste in his mouth. So much so that Roberto Masi, one of Ronald’s representatives on earth, went to the extent of taking a full-page in the national daily La Repubblica, affirming that every burger was manufactured from meat “born, raised and butchered in Italy”. Masi was responding to the less than flattering opinion of the multinational’s operation in Il bel paese that Petrini had expressed during a television interview. While McDonald's was swift to exercise its right of reply, it is unlikely to change the opinion of Petrini or the thousands of devotees that have signed up to the movement he founded in 1986 in response to the first appearance of the Golden Arches on Italian soil, near the Spanish Steps in Rome. Indeed, the movement’s name, Slow Food, says everything about its attitude to the big restaurant chains designed to satisfy society’s hunger for a quick and convenient nutritional fix. Slow Food now boasts members in more than 100 countries, and promotes international events and community projects aimed at spreading its message. There is even a non-profit institute, the University of Gastronomic Sciences, found in 2004, which offers both undergraduate and graduate courses, as well as a one-year master’s degree. So what does Slow Food stand for? Namely, a belief that traditional methods of growing fruit and vegetables and of farming livestock should be preserved, to guarantee the quality of individual products and ensure they can be enjoyed by both present and future generations. This environmentally conscious approach extends to supporting small-scale producers and the diversity that their continuing existence promotes. A natural progression from this is the full appreciation of the eating experience, around the table with family and friends, in a relaxed atmosphere, with dishes based upon the seasonality of ingredients. This is in stark contrast to the development over the past 30 years of the fast-food emporia, which has contributed to the perception of food by many people as a simple fuel rather than a catalyst for social interaction. Given the pride the nation has in a rich culinary heritage, it is no surprise that the Slow Food movement was born in Italy, but the message that it carries has resonated around the world. The campaigns initiated in classrooms, for example, aim to provide children with the means to make the connection between the environment and their food, in order to understand why this natural asset must be nurtured. So far from being an elitist organisation simply concerned with feeding the pretensions of ‘foodies’, it is one that wants to be inclusive rather than exclusive. The efforts of Slow Food are unlikely to wipe the smile off Ronald McDonald’s face for too long. But what Carlo Petrini’s organisation has done is convince a great many people to think harder about what they put in their mouth. Food for thought, indeed.